I looked at the calendar today and realized that September was ending and I had failed to give you my monthly "point of view" shots. I've been doing this series since January, with the exception of June when I was out of town, by pointing my camera in the same direction from basically the same spot each month, just to document how the garden changes through the year. And finally, here's what September looks like. Things still look fairly green here at the end of September. Just a slightly different angle, looking straight down the path. And walking a little ways down the path. By this time next month the Copper Canyon daisy on the left should be in bloom. A little farther down the path, you can see that the Hamelia patens in the distance is still in full bloom and that there are a few leaves on the ground that have fallen from the sycamore tree on the right. Pointing the camera toward the right, you can see that the flame acanthus hedge has completely regenerated from the shearing I gave it a couple of months ago and it is in full bloom again. The lemon grass dominates the plantings by the little pond, and the leaves of the magnolia tree and the redbud tree obscure the view of the house. Walking closer to the patio, you can see the Hamelia more clearly and also that the 'Tropicannas' are still in bloom. The leaves on the deciduous trees are beginning to turn yellow and brown and a few have fallen. We usually don't get intense fall colors here. We just look up one day and the leaves have turned brown and fallen to the ground. The next few weeks will see more noticeable changes in the garden as autumn's grip becomes firmer and as we get ready for what passes for winter here. I was shopping at Lowe's the other day when I happened to spy this book on a rack near the garden gloves that I was trying on. The title was appealing so I picked it up and thumbed through it and then dropped it in my shopping basket. One more success for the art of product placement. One more impulse buy. As impulse buys go, this turned out to be quite a useful one. 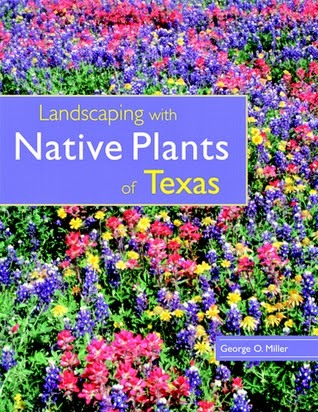 I'm always looking for more information to help me with the establishment and improvement of my Southeast Texas habitat garden, and this book is quite chock full of such information. The author, George Oxford Miller, is an environmental photojournalist and the book features his pictures of the plants which he discusses in the text. There is an amazing variety of them - wildflowers, shrubs, trees, vines, cacti, and groundcovers. These are all native plants that are adapted to the ecosystems where they thrive, and, thus, a gardener within one of those ecosystems can be pretty well assured that the recommended plant is going to do well for him or her. There are few things more deflating to a gardener than placing a beautiful, healthy plant in the garden only to watch it decline and wither. Not much chance of that with these tough plants. The trend toward using native plants in landscaping has been one of the more heartening occurrences in gardening practices in recent years. It is easy to understand their appeal. Native plants meet many of the needs of the home gardener. They can provide year-round beauty with virtually no maintenance. Moreover, using native plants contributes to the repair of the natural ecosystem and makes our gardens a more integrated part of the environment. The vast diversity and spectacular array of native plants in Texas provides species that can combine ornamental qualities, beauty, adaptability, growth habit, and low maintenance for the maximum value to the landscape. That diversity is very much on display in this book in which the author provides in-depth plant profiles that describe the habitat requirements of the each plant and help the gardener select the ones that meet his/her needs. In an early section of the book, George Miller provides drawings which illustrate Texas' landscape zones. These illustrations include information about the mean annual precipitation in the various zones, as well as the cold hardiness of the area. There is also a map which shows the ten vegetative zones of the state and the descriptions of those zones detail the prime geological features and the type of vegetation that is native to them. Overall, I found the book well-written, devoid of jargon, and presented in a way that was very practical and useful to me as a gardener. In addition, the pictures of and descriptive text about the native plants will be helpful in clearing up questions of identification of plants. I do have useful field guides, but many species are very similar to each other and sometimes it helps to have just one more perspective from one more picture. So, this is not one of my impulse buys that is destined to be thrown out with next week's trash. This one is a keeper. 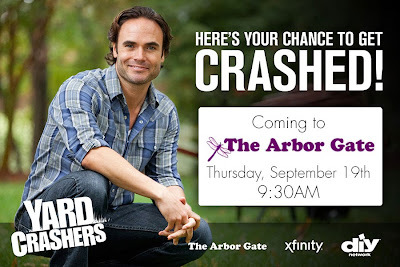 Do you watch the show "Yard Crashers" on HGTV? I confess I've never actually seen it because I swore off watching shows like it some time ago. You know the type - the cameras and crew, featuring at least one hunky landscaper, descend on a yard that looks like a total disaster area and overnight, or over a period of a few days, they turn it into a dreamscape, a garden that lives up to all the owner's most dearly held garden fantasies. 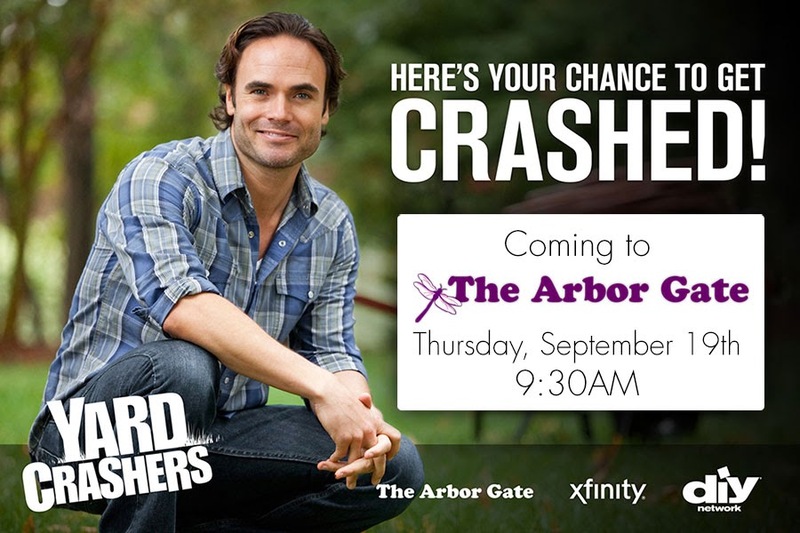 Now, goodness knows, my garden could surely use some dreamscaping, so even though I'm not a fan of such shows, when the September newsletter from The Arbor Gate announced that the show was coming to town and would be at their nursery today, I briefly considered attending. They were going to select one lucky customer to receive one of their patented garden makeovers. Maybe I would get lucky. Stranger things have been known to happen. Then I looked again at the date they would be there and realized that I had to be in Houston at that time. So much for that short-lived fantasy. This morning as we went into town, we traveled down FM 2920 which runs by The Arbor Gate, and it quickly became apparent that I was probably the only owner of a garden in the area who hadn't shown up for the "Yard Crashers" event. It was still early but already the nursery's two parking lots had overflowed and cars were parked on either side of the road for at least a mile along the way. Who knows how far the line of cars reached by the time the event was under way? Obviously, the show had plenty of customers to choose from to select the lucky winner of their makeover. I assume that at some point in the future that local garden and gardener will be featured on one of their episodes. If I know about it in advance, I might even break down and watch it. And as I watch it, I can only dream about what might have been if only I had been able to present the sad tale of my garden to the judges. I'm sure I could have been a winner. September Bloom Day. One week away from the beginning of autumn. Let's see some of the things blooming in my Southeastern Texas garden here in mid-September. Crape myrtles, of course - the queen of the summer southern garden. Nearby, the 'Coral Nymph' salvia has also been a faithful summer bloomer. This little red ruellia has done well for me. And, of course, 'Katie' ruellia is downright incorrigible, which makes some gardeners hate it, but I quite like it. Speaking of incorrigible, Turk's Cap blooms twelve months of the year in my garden. This "volunteer" wildflower is either marsh fleabane or camphor weed - I think. I'm leaning toward marsh fleabane. Justicia 'Orange Flame' has been in bloom for a long time and continues to put out a fresh blossom or two each week. The little Blackfoot daisies are not at their best just now but they continue to give me blooms. A single bloom from the shrimp plant. I find these blooms fascinating and hummingbirds love them. The Lobelia 'Cardinal Flower' is almost blooming - close enough to count for Bloom Day. Some of the roses, such as this old 'Caldwell Pink,' are beginning their autumn flush of blooms. 'Graham Thomas' is always at his best in autumn. I have several varieties of lantana in my garden and they are all blooming now. We'll let this golden yellow one stand in for them all. The oxblood lilies, or schoolhouse lilies, continue their September bloom. And the datura continues to attract the nighttime pollinators with its beautifully scented blossoms. The 'Tropicannas' have bloomed prolifically for me this summer and they continue to do so. But the star of my garden this summer has to be Cape Plumbago, sometimes called Blue Plumbago. My plants have been in bloom without a break since spring and, here in mid-September, they continue to be covered in these lovely blue, butterfly-attracting blossoms. It's still quite warm in my garden, but the temperatures are moderating - low 90s Fahrenheit instead of high 90s - and in just one week my favorite season of the year begins. Hold on - autumn is coming! Thanks to Carol of May Dreams Gardens for again hosting Bloom Day for us. Thank you for visiting my garden this month and happy gardening! 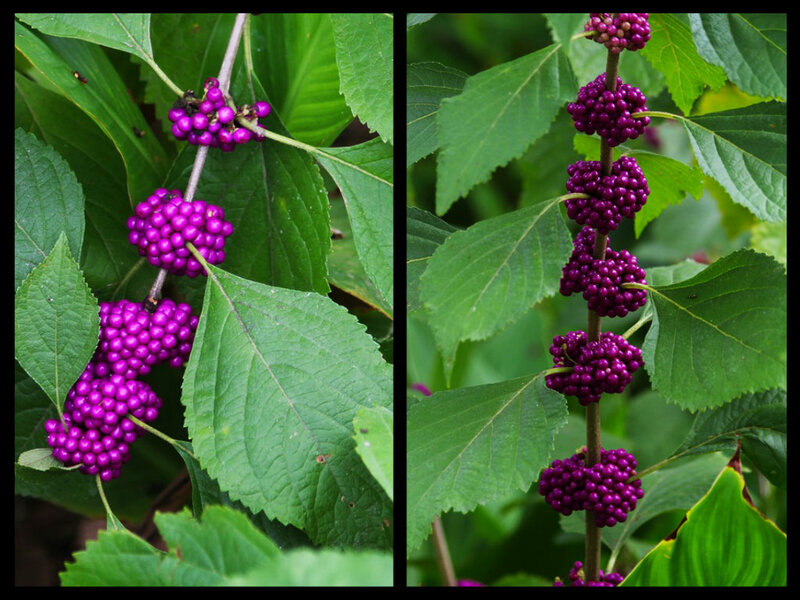 The berries which give beautyberry its name, photographed in my garden this week. Beautyberry is well-named. Those shiny berries that develop in late summer and early fall on the 3-5 foot tall shrubs are indeed very attractive, both to humans and to birds which love to feast on them. In fact, I am sure that all the purple-berried beautyberries in my yard were planted by birds - birds who either pooped out the seeds from the berries or dropped them in flight. I do have several of these native shrubs from the verbena family, because, generally, if possible, I just leave them alone and let them grow where they are planted. 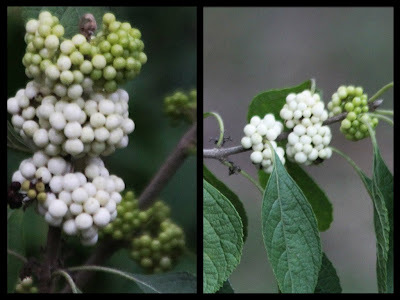 Historically, Native Americans made a tea from the leaves and roots of American beautyberry (Callicarpa americana), sometimes called French mulberry, which they used for sweat baths for rheumatism, fevers, and malaria. A root tea was used for dysentery and stomach aches. Root and berry teas were used for colic. The plant is very valuable in a native plant landscape because it attracts birds and butterflies. In areas where deer are a nuisance, unfortunately, it also attracts them. For gardeners looking for a carefree shrub to add to their gardens, this could be the answer to their dreams. Once established, it requires virtually no maintenance. The only thing I ever do for mine is to prune them back when they get too big for their space. They can be pruned severely before new growth starts in the spring to control the plant's size, and they can be pruned throughout the growing season if they need to be shaped or the size further controlled. In addition to the more familiar purple-berried plant, there is a white-berried variety which I also have in my garden. The white berries, for whatever reason, seem to be even more attractive to the birds in my yard. They will strip this shrub of its berries before moving on to the purple berries. The shrubs are deciduous and so are not especially attractive in winter and sometimes during prolonged droughts, as we are prone to have in Texas, they will lose some leaves and the fruit may not develop properly. But, in my backyard, for three seasons of the year, they are an attractive and valuable addition to my habitat garden.